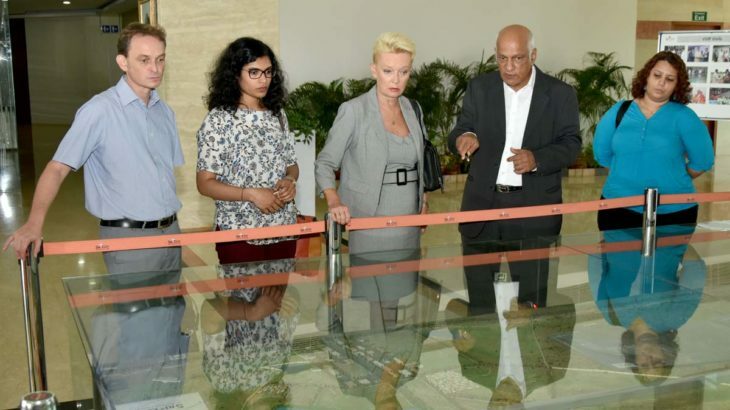 Sri City, April 25, 2018 – Ms. Catherine Suard, Consul General of France in Puducheri & Chennai, along with a team of officials visited Sri City on Wednesday. Mr. Ramesh Subramaniam, President, Sri City Foundation extended a warm welcome, and briefed her on the infrastructure and unique advantages of doing business in Sri City. The intent of Consul General’s visit was to witness the existing infrastructure at the mega industrial park and assess its business potential. She evinced keen interest and inquired on different aspects of Sri City. She went round the industrial hub and visited the production unit of Alstom. After witnessing the brisk works in progress on metro rolling stock, she said,”I feel I am at the metro hub in Sri City”.